Ask fellow campers about "Three Flags RV Park" and nearby attractions. 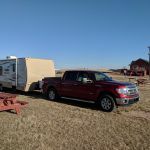 We stopped here in late March 2019 on our way through South Dakota and just needed a quick place to overnight and refresh our water and empty our gray and black tanks. The woman who lived on the property was gracious to let us stay so early before camping season and she charged us a special off-season rate. I believe this campground is probably pretty popular with the bikers who come to Stugis in the Summer. In late March we were one of two RVs so we basically had the place to ourselves. Close to the freeway, so tenters might find it a little noisy, but we enjoyed staying there and would do so again. We camped at Three Flags RV Park in a Travel Trailer. Entering the park on the dirt/gravel road is a slow process if you don't want to be completely engulfed in dust. The owner is friendly and helpful, and while the facilities are limited, this is the lowest priced park (with Passport America) in the area. Long gravel/grass pull thru was fairly level, in full sun, and the hookups were accessible. Road noise was not an issue for us, just a drone in the background, and the train only runs twice during the day. Park WiFi was generally usable, and Verizon cell/data was strong. Pay cable service, but plenty of OTA channels and no obstructions to TV satellites. Convenient to Rapid City and the Black Hills. A good stay if using Passport America. We camped at Three Flags RV Park in a Motorhome. The staff was friendly and courteous. The water pressure was good. The WiFi was not great. We had good service on our ATT phones. There was adequate room for truck and RV but the sites were close. A little bit of noise from the highway but not bad enough to keep us from sleeping. We used this as a base for the activities around Rapid City. We camped at Three Flags RV Park in a Fifth Wheel. 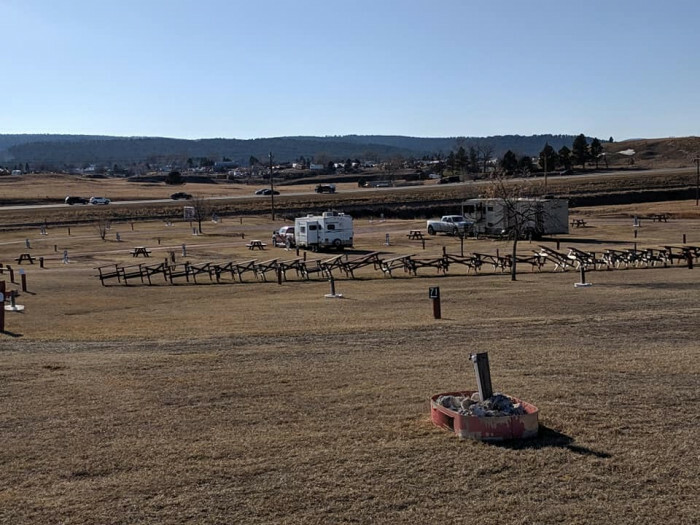 Older RV park just outside Rapid City. The owner is fabulous. Very helpful, friendly, and works hard to maintain the park. Each site is level with dirt and grass. There is a picnic table at each site. Spacing is good, but there are no trees or privacy. All the utilities worked well and are convenient. Park WIFI is fabulous - fast and stable. Cell phones signals are strong for both Verizon and ATT. Access roads are gravel and easy to navigate, though dusty. Laundry is $2.50 for wash or dry. They have a propane filling station onsite. The bathrooms and laundry are "surface clean". Tops of dividers, window sills and corners are dirty, have cob webs, and spiders. The entire park is showing it's age, needs upgrading, painting, and deep cleaning. The park is next to the highway with never ending noise. There are train tracks between the park and the highway with a trains passing few times a day. Rated as Average. We might stay there again due to the great owner, but the constant highway noise is not pleasant. We would look for other options first. We camped at Three Flags RV Park in a Motorhome. Close to Sturgis Convenient to explore the Black Hills Close to Mt Rushmore Be sure to take advantage the wonderful city parks in Rapid City. The staff is really nice and accommodating. The sites are level. Sprint cell uses roaming. The wifi was spotty but adequate. Water and power were good. Easy in, easy out. There is .6 mi. of dirt road but it is of no consequence... just drive slow. We camped at Three Flags RV Park in a Fifth Wheel. Rapid City is close enough to do some shopping while here. Friendly staff, level site, limited number of sites, no full hookups. The low rating is due to proximity to I-90... you can almost read license plate numbers as the West bound lanes are maybe 100 yards away! Plus you get the added bonus of a motorcycle community who must be tone deaf by way of straight pipes... We camped at Three Flags RV Park in a Fifth Wheel. The ONLY thing we don't like about this park is the long gravel road into the park. However, it is kept graded quite well. The owner of this park does a wonderful job keeping it looking nice, even when there is a full house. The lawns are kept looking nice all the time. We had a 50 amp pullthrough and the power was good, water was good, wifi was so-so, but it was a full park all the time we were here due to the Sturgis Rally. We got 15-20 channels of OTA TV and the park may have cable, but we didn't bother to get a box because the OTA was good. You can't beat the convenience of this location, 5 miles from Rapid City and 22 miles from Sturgis. Washers and dryers were each $2.25. There are only a couple trains each day, one at noon and another in the afternoon. We heard no trains at night. Highway traffic wasn't bad with earplugs, but may not bother you with no earplugs. There is a picnic table at each site. This is the fourth time we have stayed at this park. Our site originally looked like it would be unlevel, but we found a spot and it was perfectly level. With a toyhauler, we will have to move the trailer towards the front to load up again, but that is no problem and will make the ramp less steep. The view from our site was beautiful. We camped at Three Flags RV Park in a Fifth Wheel. Mount Rushmore, Spearfish Canyon and the waterfalls (Roughlock and bridal veil can be seen from the road) Deadwood, Hill City, Sickies Garage between exits 60 and 61 is a fun restaurant. Firehouse Brewery downtown on Main Street, Main Street Park, Custer State Park, Needles Highway...so much to do around here! Oh, don't forget Devils Tower west of here. 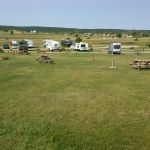 A no frills RV park that is far enough away from the hustle and bustle of the attractions that is peaceful. Passport America park that has very long pull thru sites that are very level. Clean bathrooms and showers . Excellent Wi-Fi and cable if you want a box or plenty of OTA channels. Close to I-90 but no highway noise. Spacious grass sites. We camped at Three Flags RV Park in a Motorhome. We only stayed one night as we were passing thru. The Lady was the owner and Very pleasant. We had a mechanical problem with our toad and she came and helped us push it. Later after she closed up she came by to make sure we had things under control and stayed and had a relaxing drink with us. Satellite friendly. Good OTA tv. We camped at Three Flags RV Park in a Motorhome. Three Flags RV Park is a Passport America park that will honor that rate for the entire week. Our GPS devices agreed on the route and brought us right to the park. This is a one woman show and the owner was mowing when we got there but saw us and came to check us in. The roads and sites are gravel. The sites are well spaced with grass between them. We got a lot of rain while we were here and the sites drained pretty well. The hookups were convenient for our long pull thru. We had a good line of sight for our roof mounted satellite dish. We had 3 bars ATT cellular and 2 bars ATT 4g. There is so much to see and do in the Black Hills area that we no doubt will be back in the area again. We would stay here again especially since it is one of the nicer Passport America parks we have stayed at. We camped at Three Flags RV Park in a Fifth Wheel. Approx. 5 miles west of Rapid City on I-90. 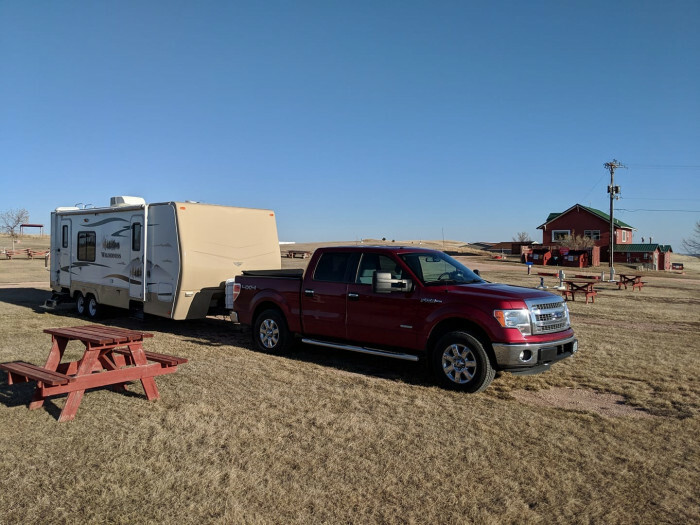 My ideal kind of RV park.....long (42' 5th wheel and truck, disconnected and still room to spare.....80'? ), wide spaces, good electric, water and sewer dump, picnic table, grass and fairly level. Easy in and easy out navigation. Others have complained about the .4 mile of dirt/gravel road being dusty. The posted speed limit is 20 miles however, having gone in and out a number of times, I've found that 10-15 mph there isn't any dust. We camped at Three Flags RV Park in a Fifth Wheel. Diesel fuel, Camping World just across the freeway. Black Hills.....too much to see and do in a week! Pick up the Black Hills map available in the RV Park office or just about any store or gas station in the Black Hills area. Be sure to ride your motorcycle (or drive) through the Needles Hwy. I rode my bike and drove my 1 ton dually. Good value for FHUs , good elect, sewer and wifi. water pressure a little low and we could not get cable with the cable box that they provided but we could get broadcast tv. The site was a nice pull-through with room for40' MH & our toad plus. The park is very close to the interstate with a train track in between so there is more noise from both than I remembered from my last visit here. We camped at Three Flags RV Park in a Motorhome. Good central location between Rapid City , Sturgis, Deadwood, Lead and Custer SP. We traveled by car through Spearfish Canyon, and the other towns I named. 6 Miles from Rapid City where I volunteered with Habit for Humanity . Other than the long dusty gravel road into the park it was great. WiFi tested at an amazing 30 megs. Don't rely on the GPS to find the park. Call for easy directions. Our Google map program led us astray down a dirt road luckily to a business with a large enough parking lot to turn around. 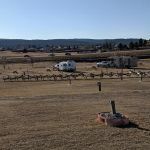 We camped at Three Flags RV Park in a Motorhome. We have stayed here a few times over the past 10 years and every year the water pressure gets worse. We had to turn on our water pump this year every time we took a shower to get enough pressure. The laundry is $2.25 to wash and $2.25 to dry and is fine if you want to pay $9 for two loads of laundry. The nice lady that owns and runs the place by herself seems to be in way over her head. We will probably look for someplace else if we come to this area again. We camped at Three Flags RV Park in a Fifth Wheel. Ask about the water pressure as it was suppose to be repaired. Diesel fuel, Camping World just across the freeway. Black Hills.....too much to see and do in a week! Pick up the Black Hills map available in the RV Park office or just about any store or gas station in the Black Hills area. Be sure to ride your motorcycle (or drive) through the Needles Hwy. I rode my bike and drove my 1 ton dually. You are close here to Wall Drug and the Badlands as well as Mt Rushmore and Crazy Horse. Also close to Sturgis, Deadwood, and Spearfish Canyon. Devils Tower is a little over an hour and a half away, but worth the drive! We spent more than a week here and plenty of sightseeing and things to do. Good shopping in Rapid City, about 15 minutes away. Camping World close by. It's a tourist mecca... Deadwood, Hill City, Mount Rushmore, and many other attractions in the area. Don't miss the Spearfish Canyon scenic drive! Start at Spearfish (30 min away) and drive 14A to Lead (Black Hills Mining Museum) and then Deadwood. Also Devil's Tower (1.5 hrs away), Mt Rushmore (45 Min), Jewel Cave (1.2 hrs), Badlands NP (1 hr). Great eats and brews at Firehouse Brewery Rapid City. Close to all the attractions in the area. This is a good centrally located RV Park whale visiting Mt. Rushmore and Crazy Horse. Also there are many small villages in the area. Rapid City is a easy five miles east on the interstate. Mt. Rushmore & the Black Hills are what you stop here to see. Badlands NP, Mt. Rushmore, SD Air & Space Museum, downtown Rapid City, Sturgis, Hill City. Beautiful scenery towards Mt. Rushmore. Scenery in Badlands NP is awesome. Good shopping in Rapid City. Used Planet Fitness every few days. NOTE: Very disappointed at Crazy Horse. Has not changed since our last visit in 1990. Has become very commercialized and expensive. Take in "Bear Country USA." It is a very nice wild life preserve. Day trips to Sturgis, Mt. Rushmore, Crazy Horse Memorial, Rapid City. Good base camp for Deadwood, MT Rushmore, Crazy Horse and Rapid City. Are you affiliated with Three Flags RV Park ?